Amazon offers consumers the ability to research and buy parts, but its same-day delivery opens the door to commercial customers. Amazon's involvement in the aftermarket parts trade is about to get a little bigger. Aftermarket suppliers and automotive parts retailers say Amazon's same-day delivery service and status as a widely popular research portal may help the company carve out a larger place in the aftermarket. Rather than being a threat, that growing role could help parts companies. The need for quick access to parts for repair was a major reason the aftermarket once sat outside Amazon's reach. But its same-day delivery abilities now make Amazon "much more compelling because one of the big issues is quick availability," said Dan Ninivaggi, CEO of Federal-Mogul Motorparts, the aftermarket parts division of Federal-Mogul Corp.
Changes in Amazon's delivery practices could shake up the competition, suppliers believe. There are two types of aftermarket parts customers: do-it-yourself customers and commercial customers. The DIY-ers traditionally account for most online parts purchases. But Amazon's same-day delivery opens the door to commercial customers, such as professional installers, Ninivaggi said. AutoZone Inc. spokesman Ray Pohlman said most consumers want "uninterrupted" transportation. "They can't afford to have their car sitting on blocks for a couple days" waiting for repair parts, he said. Eighty percent of AutoZone's business goes to DIY customers and 20 percent to commercial ones. AutoZone firmly established itself in the DIY market and now is growing its commercial business, but Pohlman said Amazon's same-day delivery service "gets closer to our wheelhouse." Amazon is hardly new to the parts game. The company has been working with suppliers for years. Bosch Automotive Aftermarket, a unit of the industry's largest original-equipment supplier, Robert Bosch GmbH, has been working directly with Amazon for almost 10 years. A Morgan Stanley Research report listed Amazon's longtime relationship with suppliers as one of the reasons it "poses a long term threat" in the aftermarket. 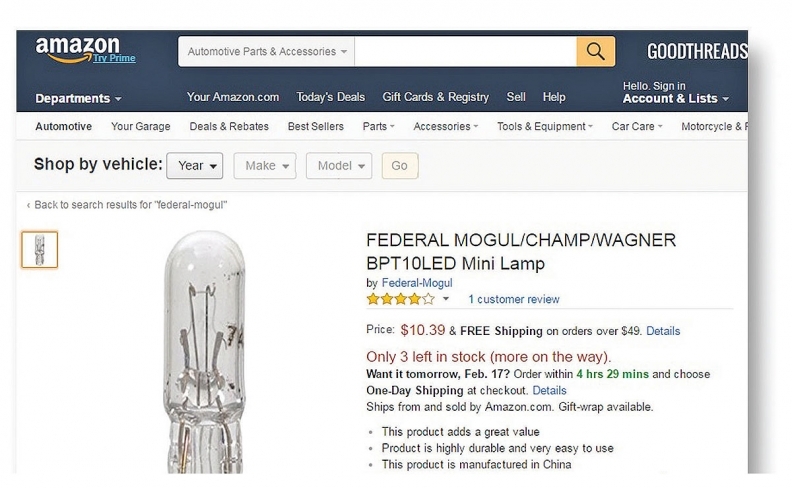 Federal-Mogul Motorparts began working directly with Amazon about a year ago. Ninivaggi said the relationship started when Federal-Mogul realized consumers were researching its parts on Amazon, even though the parts were not directly supplied by Federal-Mogul Motorparts. Third parties were selling them through Amazon. "We were concerned about our products being sold online without our service, so we decided to engage with online players, including Amazon, directly," Ninivaggi said. "It's important that our products are represented accurately and people get direct service from us. Amazon is good about that." Half of aftermarket customers today research products online before purchase on sites such as Amazon, Ninivaggi said. By 2020, virtually all customers will research parts online before buying. Business with Amazon is important for that reason, he said, emphasizing that the vast majority of his business remains with traditional customers, such as auto parts retailers and warehouse distributors. Federal-Mogul Motorparts said it's working to expand sales with Amazon from the U.S. market to Canada and other regions. Another major reason Amazon could grow in the aftermarket, according to Morgan Stanley, is its perceived ability to take a lower profit margin, paying suppliers more for parts while selling them for less than traditional retailers. Ninivaggi said he was not selling his parts cheaper to Amazon. Amazon has its limits, some industry players point out. Amazon does not have the ability to customize products based on local market needs or sell parts to customers in nearby markets, according to Morgan Stanley. In a conversation with Automotive News last year, Cars.com CEO Alex Vetter pointed out that Amazon can offer products for research through its new Amazon Vehicles portal -- but not necessarily connect shoppers to local dealerships for purchases. Amazon offers product promotions and research options such as "Frequently Bought Together," ratings and reviews. But Pohlman of AutoZone says those tools are no match for extensive in-store service and advice from brick-and-mortar stores. AutoZone offers a Loan-A-Tool program that functions like a library of tools for DIY customers; oil recycling for DIY oil changes; quick scanners for check-engine light problems; and personal product and pricing advice -- all free of charge. To form a relationship with customers and adjust the cost, quality or type of product directly to what they need will remain a strength of traditional retailers, Pohlman said, because "those are the conversations that you don't get online." 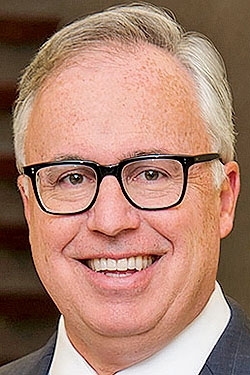 Plus, many brick-and-mortar stores have been expanding their own online presence -- not fearing online retailing but embracing it, said Aaron Lowe, senior vice president for government affairs at the Auto Care Association, which represents members of the automotive parts industry. Amazon did not respond to multiple requests for comment, but Lowe said Amazon and other online retailers "will have a part in our industry, and maybe a growing part." "But I also believe, for the foreseeable future, the brick-and-mortar retailers and distributors will have a really critical role." "Even so, suppliers can't ignore Amazon, Ninivaggi said. He plans to stick to the strategy of giving his traditional customers exclusive access to new products for a year before opening parts sales on retail sites such as Amazon. "There's no doubt Amazon will grow, especially as customers research online -- we can't ignore that," Ninivaggi said. "But we continue to support traditional customers by giving them a first shot at new products." Likewise, Pohlman said, "AutoZone spends a lot of time, money and effort helping these suppliers market and brand their parts. And we're showcasing their brands."